Vitiligo is a common skin disorder that affects about 1 to 2 percent of the population. The condition consists of one or more flat white spots on the skin that contain no pigment. The depigmentation may appear anywhere on the body in people of any age and any race. Most cases begin before the age of twenty years. 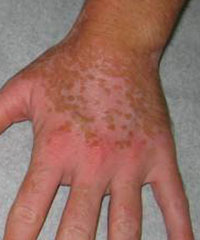 The white spots are usually first noted on exposed areas of the skin or in the body folds, often during the summer months, following a suntan. Vitiligo may remain stationary for years or may rapidly progress to involve a large portion of the skin surface. Areas of vitiligo produce no symptoms; however, because of the lack of pigment, painful sunburn readily develops with even brief sun exposure. The cause of vitiligo is unknown, and the vast majority of affected persons are in good general health, although some cases are linked to thyroid abnormalities. The problem is basically a cosmetic one; the darker the original skin color, the more noticeable the condition is. The psychological effects are often devastating. Study has indicated that, in over one-half of all persons with vitiligo, the disorder has significantly impaired their ability to interact with others socially. Seeking advice from a mental health counselor or vitiligo support group is encouraged. The treatment of vitiligo is not at all satisfactory, and the cosmetic disfigurement is best managed by the use of masking agents such as a walnut stain (Vitadye) or concealment cover-ups such as Covermark and Dermablend. These may be purchased in finer department stores, where aestheticians will match the coloring agent’s shade with the individual’s original skin color. Certain medications (called psoralens) in conjunction with sun or artificial light may enhance repigmentation but should only be administered by a dermatologist experienced with such therapies. Another light source, UVB Narrowband, may afford comparable results and is easier to administer. Multiple treatment sessions are required. Early vitiligo may respond to topical treatment with potent topical steroids or the calcineurin inhibitors Elidel and Protopic. A remedy for severe vitiligo is permanent depigmentation with the prescription topical bleaching agent monobenzone (Benoquin). This is a drastic step as the loss of pigment is irreversible and permanent. Michael Jackson is rumored to have undergone such therapy. Individuals with vitiligo should always use a broad-spectrum sunscreen on affected areas; this will help protect the skin from becoming sunburned and from developing skin cancer. Several reports indicate there are individual nutrients that seem to be beneficial: Para-aminobenzoic acid (PABA), a water-soluble B-vitamin found in bran, brewer's yeast, eggs, milk, rice, wheat germ, and whole wheat, taken along with a B-complex supplement, has produced improvements in people with vitiligo. Several studies have shown that hydrochloric acid secretion is often low in the stomachs of individuals with vitiligo. Supplementation with hydrochloric acid, a strong acid released by the stomach lining and important in the digestion process and B-complex may be beneficial as well.